Intex Aqua SX is a new dual-SIM smartphone from India's mobile manufacturer Intex. That praised at Rs. 4,490. 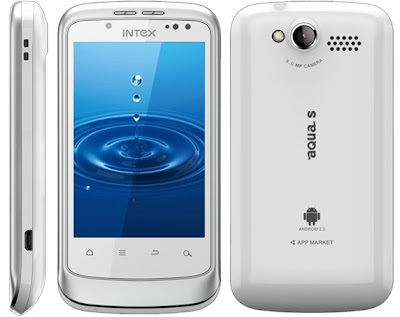 Intex also released Intex Aqua Star dual-SIM smartphone for Rs. 3,990. The smartphones currently listed on Intex official website quietly. Intex Aqua SX come with 3.5-inch TFT capacitive touchscreen with 262 K colors and 320 x 480 pixel screen resolution. It runs on Android Gingerbread OS and it powered by a 1.0 GHz processor that mounted on MTK6515 chipset with 256 MB of RAM. For data storage it come with 512 MB ROM and 128 MB internal memory. Storage space expandable up to 32 GB via MicroSD card slot. Aqua SX sports a 5.0 MP rear camera and a VGA 0.3 MP front facing camera. The handset support English and Hindi languages and advanced auto call record feature enabled. 3G, Wi-Fi, EDGE, GPRS, WAP, and Bluetooth connectivity options included. The handset features 1450 mAh battery; that gives up to 5-hrs talk time and up to 360-hrs standby time. For entertainment needs it has a Audio player, Video player, and FM Radio. Also it pre-loaded with games including Angry Bird, and Fruit Ninja. Aqua SX built-in with Light sensor, Motion sensor, Proximity sensor, and G-sensor. Dimension of the smartphone is (L x W x D) 116 x 60.5 x 13 mm and 138gm weight. Agua SX available in two color variation Black and White.